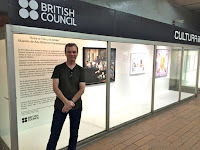 Today the last UKMX event took place… underground, in Polanco Metro station. It's an exhibition of 23 works by nine young British artists produced by the London-based Mexican curator and gallery owner, Javier Calderon, who also curated the Immersive Frames video-art exhibition across town. The latter features more established artists, but this one is an interesting experiment, using some big glass cabinets near the ticket lobby with a potential audience of 25,000 a day. It's on for three months, so do the maths!